There are a host of great players in the Minors who don't get the same attention as top-ranked prospects like Gleyber Torres and Ronald Acuna Jr. Here the MiLB.com staff picks one relatively unheralded player from each system poised to excel in 2018. It's tough to find an under-the-radar prospect in a system as loaded and touted as Atlanta's. But don't lose track of Burrows, the organization's No. 28 prospect and a fourth-round pick out of Alabama in 2016. The 23-year-old left-hander, who came to Atlanta from the Mariners along with Luiz Gohara, has plus pitches in his fastball and slider and used them to great effect in his first full season, striking out 32.6 percent of the batters he faced -- the second-highest rate among South Atlantic League pitchers with at least 60 innings. Burrows was particularly tough against lefties, holding them to a .165 average, though righties (.215) can't boast either. He has struggled at times with control (8.9 percent walk rate), but the tools of a dominant bullpen arm are there. Atlanta pushed A.J. Minter from Class A Advanced Florida all the way to the Majors last year, and they could do the same with their other dominant lefty reliever this summer. Undrafted out of Drury University in 2016, Richards looked like a steal in his first full season last year. The 24-year-old led the organization with 158 strikeouts and finished 12-11 with a 2.88 ERA in 27 appearances, including 25 starts, between Class A Advanced Jupiter and Double-A Jacksonville. The 6-foot-2 right-hander doesn't possess a blazing fastball -- it sits 90-92 mph in most instances -- but his lanky 6-foot-2 frame produces a deceptive delivery. Richards locates all his pitches well and has exceptional command, walking 30 in 141 innings. Miami's No. 22 prospect should begin the year with Triple-A New Orleans and a promotion to the Majors this summer isn't out of the question. There was a time when everything Ryan did on the mound was put under a microscope. The 22-year-old had only reached Class A before he was traded to the Mets for Jay Bruce, which seemed to be a small return for the All-Star outfielder. Bruce since has returned to New York and some pressure can come off the North Carolina product, who held his own in the Sally League. In eight relief appearances with Columbia, Ryan amassed a 2.08 ERA with six saves, 13 strikeouts and five walks over 13 innings. His first appearance for the Fireflies was the last in which he surrendered a run and the next outing marked the final one in which he'd allow a hit. Ryan finished the season with nine hitless frames, striking out 10 over that span. In just his first full season, Irvin shot up to Double-A. 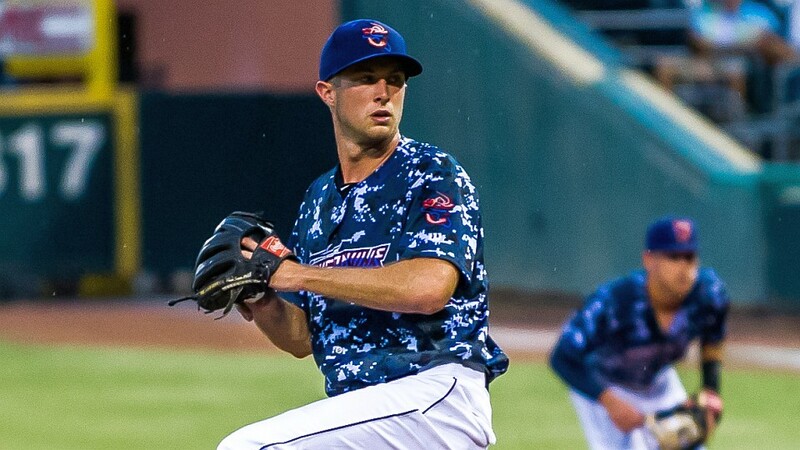 With a four-pitch arsenal, the left-hander went 9-9 with a 3.39 ERA, 118 punchouts and 38 free passes over 151 1/3 frames in 25 games (24 starts) for Class A Advanced Clearwater and Reading. Irvin got a chance to showcase his talents this spring, pitching 1 2/3 scoreless innings with one strikeout and no free passes at big league camp. If he continues to exercise optimal control as he transitions to Triple-A Lehigh Valley, the 24-year-old could be back with Philadelphia in no time. After four summers in the complex leagues, Corredor performed admirably in his first full season with Class A Hagerstown. The 22-year-old led the Nationals system with 30 doubles and batted .261/.335/.379 with five homers, four triples, 55 RBIs and 53 runs scored. The native of Venezuela must work past some issues hitting against lefties after compiling a .207 average against southpaws, but showed he was adept at hitting with runners on base. Corredor has made steady improvements since signing with the Nationals as a 16-year-old in 2012. He collected 117 hits in 120 games last season, but it's his developing power that should be an indicator as he takes steps forward. Hudson has climbed steadily through the system since being selected in the third round of the 2015 Draft, but last season marked a breakthrough. The southpaw went 9-3 with a 3.91 ERA, 81 strikeouts and 52 walks over 124 1/3 innings in 24 starts for Class A South Bend. Hudson's best pitch is his curveball, but he also induces a lot of groundouts with his sinking fastball. While the Cubs system is full of pitching prospects, the Illinois native could set himself apart if he can cut his walks down while continuing to keep the ball on the ground. Inked last June at the tail end of the international signing period, Garcia might not be ticketed for a full-season assignment out of the gate in 2018, but when he hits the field, his promise is high. The Cuban-born shortstop has a defense-first profile with speed checking in as his top-rated tool (60-grade). Garcia will turn 20 on Opening Day, and with a 6-foot-2, 175-pound frame, has room to fill out. It remains to be seen how his game will translate to the pro game, but his athleticism and tools give him a leg up. After missing the 2015 and 2016 seasons recovering from Tommy John surgery, Williams saw limited action last year. With Double-A Biloxi, the 26-year-old posted a 3.09 ERA in 46 2/3 innings over 22 appearances (14 starts), notching 57 strikeouts along the way. That earned him a September callup and the 5-foot-11 right-hander allowing one earned run over 4 2/3 innings in five Major League games. The Brewers' fourth-round pick in the 2013 Draft uses a fastball that ranges from 95-98 mph and a slider in the upper-80s to keep hitters off balance. If Milwaukee is in need of relief help this season, the Brewers 18th-ranked prospect has the potential to be an effective option. The Pirates received four players from the Astros in the Gerrit Cole trade. The 22-year-old Martin has less experience than Colin Moran, Joe Musgrove and Michael Feliz, all of whom are already in the big leagues, but don't sleep on the youngster. The 2013 eighth-round pick compiled a respectable .278 average with 18 homers, 66 RBIs and 16 stolen bases between Class A Advanced Buies Creek and Double-A Corpus Christi last year. More plate discipline would be welcome, but his tools make him a dark horse in a system relatively thin on proven outfield prospects. Perez hit a speed bump last year after a promising debut in 2016. The 19-year-old infielder batted just .203 with no homers among his five extra-base hits in 34 games split between the complex level Gulf Coast League and Rookie-level Johnson City before a hand injury ended his season. While the difficult season took a lot of shine off the 2016 first-rounder, Perez still has standout tools. The Cardinals' top talent is concentrated at the upper levels, so a rebound by Perez would be huge for the younger end of their pipeline. Almonte had little trouble in his introduction to the Class A Advanced California League. Featuring a fastball in the low-90s with tremendous cutting action, Almonte posted a 3.55 ERA and racked up 162 strikeouts in 139 1/3 innings, the third-highest total in the organization. The 22-year-old teamed up late in the season with fellow right-hander and top D-backs prospect Jon Duplantier to form a lethal 1-2 punch at the top of Visalia's rotation. Obtained from the Red Sox for reliever Brad Ziegler in 2016, the D-backs 22nd-ranked prospect will likely begin 2018 at Double-A Jackson, where he'll have to improve his control as he faces more advanced hitters. Though the left-handed pitcher made just 11 starts last year due to a strained oblique, Eusebio showed promise between Class A Short Season Boise and Class A Asheville. After going 3-0 with a 1.59 ERA, an 0.82 WHIP, 22 strikeouts and four walks in 17 innings with the Hawks, he was bumped up to the Tourists. There, the southpaw held his own at hitter-friendly McCormick Field, registering a 4.46 ERA in eight outings. Eusebio has two above-average offerings (fastball and changeup) that could develop into plus pitches. There's still a lot of work to be done, but in a system that has begun graduating solid Major League pitching talent, Eusebio could be the next name to watch. In his first season out of complex ball, Cuadrado was one of the finest hitters in the Pioneer League, batting .335/.413/.523 with 11 steals and 26 extra-base hits across 64 games last year. He won't necessarily repeat those kinds of numbers as he ascends the Minor League ranks, but the 20-year-old outfielder will grow into a top prospect if he can cut down on his strikeouts and make some swing adjustments that take advantage of his strong frame. The native of Venezuela also features a plus arm. With Fernando Tatis Jr. and Luis Urias at the top of the system, other Padres middle infield prospects face an uphill battle for attention. Ruiz is one of a few in the lower levels who are worth being excited about. Nabbed from the Royals in last summer's Trevor Cahill trade, he split the season between two teams in the Rookie-level Arizona League, batting .350/.395/.602 with 26 stolen bases and 34 extra-base hits over 52 games. His defense is secondary to his offensive skill set, but he has the chance to develop into a solid second baseman. Kirby struggled to a .220 average over 23 games to start his first full season with Class A Augusta and was shut down on May 21. He bounced back after his reassignment to Class A Short Season Salem-Keizer and eventually took home Northwest League MVP honors in his second stint with the club. The 23-year-old batted .279/.361/.424 with eight homers, 65 RBIs and 10 stolen bases with the Volcanoes. The 12th-round pick in the 2016 Draft from the University of San Diego might be at the crossroads, but he showed he's advanced beyond short-season ball after collecting more hits (77) than games played (75) with Salem-Keizer. After being selected in the sixth round of last June's Draft out of the University of Iowa, McCoy notched two RBIs out of the gate in his pro debut. The shortstop kept it going from there, batting .301/.382/.409 with 29 RBIs and 34 runs in 53 games with Class A Short Season Aberdeen. McCoy, who turned 23 on Saturday, got into two big league Spring Training games, collecting a walk and a run scored. In his full-season debut, the Orioles No. 30 prospect should continue to flourish. A career .332 hitter in the Minors, the 20-year-old Castellanos produced a .339 average over 52 games in the Gulf Coast League last season. He finished second on the complex circuit with 63 hits and third with 85 total bases. That's as successful a first stateside season as the Venezuela native could hope for. The Red Sox No. 18 prospect has some history in the corner outfield spots, but first base became more of a priority position in 2017, meaning he'll have to show more power than his two homers and .457 slugging percentage to provide value, but he has the size at 6-foot-3, 195 pounds to make that happen. Could the two Bash Brothers in the Bronx have a little sibling at the lower levels? Garcia split his time between Rookie-level Pulaski and Class A Charleston in 2017 and hit 17 homers in 63 games. His .293 isolated slugging percentage was the highest among any teenaged Minor Leaguer with at least 250 plate appearances. The 20-year-old has trouble making consistent contact, however; he hit just .227 with a 33.6 percent strikeout rate at the higher level. Garcia is likely headed back to Charleston, and if he can find a way to improve his contact and keep his power, his profile could soar. Signed out of the Dominican Republic in November 2013, Cabrera is only 6-foot-1 and 170 pounds, but there is more than meets the eye when he gets on a mound. The 21-year-old has a very slick delivery and a fastball that sits in the mid-90s with the ability to touch 97. Cabrera also features a plus slider that attacks hitters with sharp, late life and he is refining his changeup. After a midseason promotion to Double-A last year, Cabrera amassed a 3.62 ERA with 51 strikeouts in 12 starts. The southpaw will return to Montgomery to open this season. Even if he can't improve his changeup, Cabrera could still be an effective Major League reliever. Davis' 2017 regular season was nothing special, hitting .249 with 10 jacks and 20 stolen bases in 34 attempts over 128 games for Double-A New Hampshire, but the 25-year-old outfielder excelled in the Arizona Fall League, finishing the campaign with nine hits in his final five games. Davis, often referred to as "JD," got an extended look at big league camp and the Blue Jays are high on his makeup and above-average speed. The club's No. 28 prospect is on track to reach Rogers Centre this summer. Acquired from the Cardinals for Zach Duke at the 2016 trade deadline, the 2011 second-rounder soon was sidelined with a left hamstring strain. A stress reaction in his right foot and a fracture in his right ankle kept him out last season. If he can remain healthy, the 25-year-old center fielder has speed and gap-to-gap line-drive capabilities that make him a prototypical leadoff hitter for Triple-A Charlotte. The 2016 fifth-round pick finished third in the Midwest League with 22 homers while driving in 61 runs and stealing 15 bases last season. With 55-grade power and run tools, the 20-year-old needs only to make more contact after batting .246 with 108 strikeouts. Power is usually the last tool to develop as players get older and grow into their bodies, but Capel has clearly checked that box already. Keep an eye on him this season to see whether he can improve his hit tool. Gutierrez was part of a trio of Venezuelan hurlers that included right-hander Anthony Castro and southpaw Eudis Idrogo in a rotation that led Class A West Michigan to the Best Team MiLBY in 2017. The 22-year-old delivered a 10-7 record in 24 appearances -- 20 starts -- with a 3.06 ERA and 127 strikeouts while holding opposing batters to a .213 average over 126 1/3 innings. Signed as a Minor League free agent in 2012, Gutierrez was not stretched beyond seven innings in any start last season and twice earned Midwest League Pitcher of the Week honors. DeVito isn't among MLB.com's Top 30 Royals prospects, but the 23-year-old has real power. After swatting nine homers in 60 games during his professional debut in 2016, DeVito crushed 21 more between Class A Lexington and Class A Advanced Wilmington last season. Overall, the University of New Mexico product hit .266/.308/.459 with 54 extra-base hits and 91 RBIs, which ranked second in the system. His approach at the plate bears watching as he walked just 29 times in 133 games last season. He did earn 31 free passes in 60 games with Rookie-level Burlington a year earlier, so he's capable of working the count. 2017 was a lost year for Arraez, who tore his ACL in the third game of the season. Prior to his injury, the Twins No. 23 prospect showed a tantalizing hit tool. Although he doesn't hit for much power, Arraez carries a .338 Minor League average into 2018, which includes a Midwest League batting crown with Class A Cedar Rapids in 2016. The 20-year-old posted a .347/.386/.444 line with 31 doubles and 66 RBIs in 103 games for the Kernels. Although not overly athletic, Arraez's ability to make consistent hard contact coupled with a tremendous knowledge of the strike zone should prove beneficial as he faces stiffer competition. At one point Chuckie Robinson wasn't even the most promising catching prospect on his own team. The 2016 21st-rounder opened last season behind Jake Rogers on Class A Quad Cities' depth chart. When Rogers was promoted, Robinson made the most of his opportunity, batting .274/.330/.463 with 15 homers, two triples and 32 doubles in 108 games for the eventual Midwest League champs. His best tool is his arm, with a 41 percent caught-stealing rate as evidence. That and his power potential have placed him squarely in Houston's long-term plans behind the plate -- and with Rogers now in the Tigers system, Robinson's path has become clearer. A 6-foot-6 right-hander who turns 19 in June, Aquino already works comfortably with a lively fastball in the mid-90s. He has a great spin rate on that offering and his curveball, giving him the foundation to develop into a truly dangerous pitcher -- especially if his changeup improves. He's already impressed at the Rookie level, fanning 29 over 23 2/3 innings in the Dominican Summer League and then making two fine relief appearances in the Arizona League last year. Just two years ago Laureano was one of the rising prospects in the second tier of a loaded Astros system. After regressing last season with Double-A Corpus Christi, however, the 23-year-old was traded to Oakland in November. Laureano's calling card is his speed, and he will always be a threat on the basepaths. Playing in the hitter-friendly environs of the Pacific Coast League could be exactly what he needs to jolt his offense back to 2016 levels, when he batted .319 between Class A Advanced and Double-A. The Mariners outfield prospect went from a question mark offensively to his team's Minor League Hitter of the Year in 2017 with a .307/.355/.393 line over 124 games at Double-A Arkansas and Triple-A Tacoma. Miller's retooled approach and success at the plate enabled his 70-grade speed to become a serious weapon -- being on base more gave the 2013 14th-round selection ample opportunities to swipe 43 bags last season. The 26-year-old also has the ability to play all three outfield positions. Alexy changed addresses last year when the Rangers acquired him as part of the Yu Darvish deal with the Dodgers. He immediately impressed, striking out 27 batters in 20 2/3 innings and recording a 3.05 ERA and a .178 opponents' average against in five starts for Hickory following the trade. At 6-foot-4 and 195 pounds, the Pennsylvania prep product could still improve an already stellar fastball. His curveball is a plus pitch, and he's bringing his changeup along. If it all comes together, the 19-year-old Alexy could zip through Class A Advanced Down East this season.